The unbeaten WBC heavyweight champion’s last two fights have come after his original opponents – Alexander Povetkin and Andrzej Wawrzyk – tested positive for banned substances. Now, Wilder (37-0, 36 knockouts) faces unbeaten substitute Gerald Washington (18-0-1, 12 KOs) next week in Birmingham, Alabama. He interrupted training camp to spend eight days in New York for a trial, seeking the $5million he was scheduled to receive for the Povetkin fight last summer. A jury unanimously ruled in his favour on Monday. Wilder celebrated the ruling even as he bemoaned the circumstances surrounding his last two fights. ‘I was shaking my head. It’s sad,’ Wilder said in a conference call on Thursday. ‘It’s sad for the sport. I just hope something even more can be done about this situation before it ruins the sport of boxing. ‘I think the WBC is doing a fabulous job in bringing the doping program and having these fighters sign up for it and if they don’t they’re off the rankings. But I also would like to see it go into second gear. Wilder said winning the Povetkin case was a step toward warning fighters of the potential consequences, but wants violators to lose more than money. ‘They need to take their career away from them because this is ridiculous,’ he said. 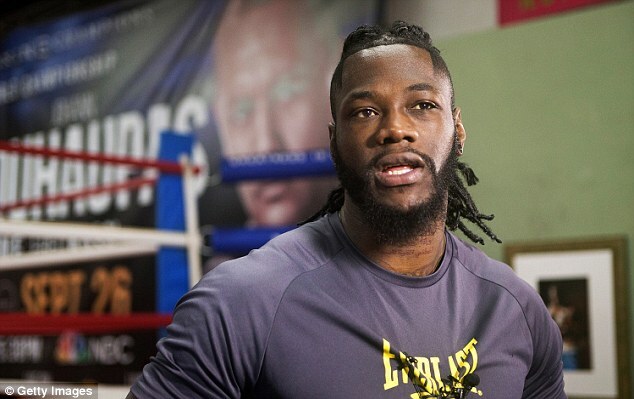 Wilder said trainer Mark Breland went with him to New York for the trial, but that weather and long days in court did cause him to miss some training time. He hasn’t fought since a ninth-round knockout of Povetkin replacement Chris Arreola last July, when Wilder suffered a broken right hand and torn biceps in the same arm.